In Soviet Russia, zombie pig punch you. What's a down-on-his-luck street fighter to do when The Man rolls in, rounds up his buddies and force feeds them experimental drugs? Go on a bloody violent rampage through the streets of an alternate history U.S.S.R., of course. 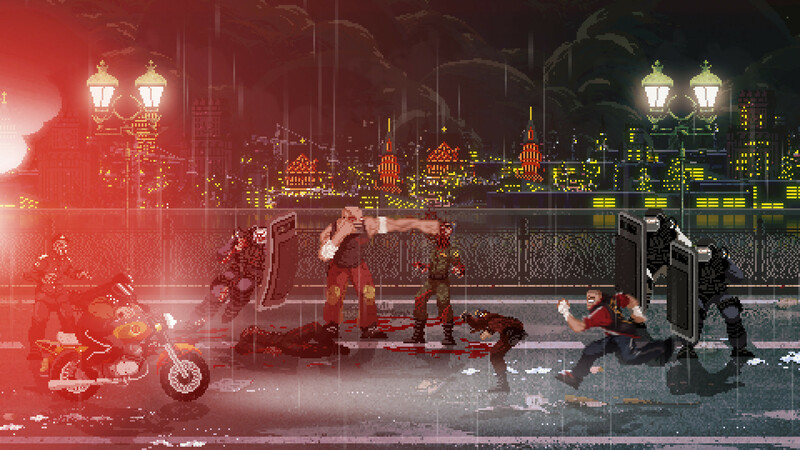 Mother Russia Bleeds is a classically-styled sidescrolling beat 'em up that focuses on one thing: combat. Also drugs, but the drugs are related to combat, so we'll count it as one thing. Four fighters offer a bit of variety right from the start. Ivan's got the range and the muscle, making him a great choice for anyone who just wants to hurt people. Natasha is light on her feet but has the shortest range. Sergei and Boris are a little more balanced, with the former slightly favoring speed and the latter range. Combos and general play styles remain the same no matter who you side with, so it basically comes down to choice. 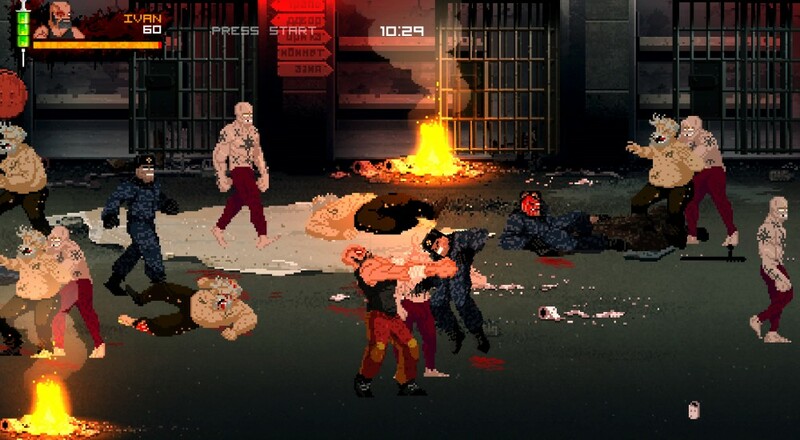 As was the case with old school brawlers like Final Fight, Streets of Rage and Double Dragon, Mother Russia Bleeds gives you a few stock moves you can elaborate upon in the heat of battle. There's a basic punch that's easy to chain into a three hit knockdown combo. You can also charge your punch for a power hit, great for groups of low-level baddies. Kicks deliver more power at the cost of some speed. Throws, dashes and sidesteps let you control battlefield positioning. You can also pick up weapons knocked out of enemy hands and use it against them. Bats, police batons, even guns are all fair game. Combining these moves and experimenting with directional presses is the key to causing maximum damage. 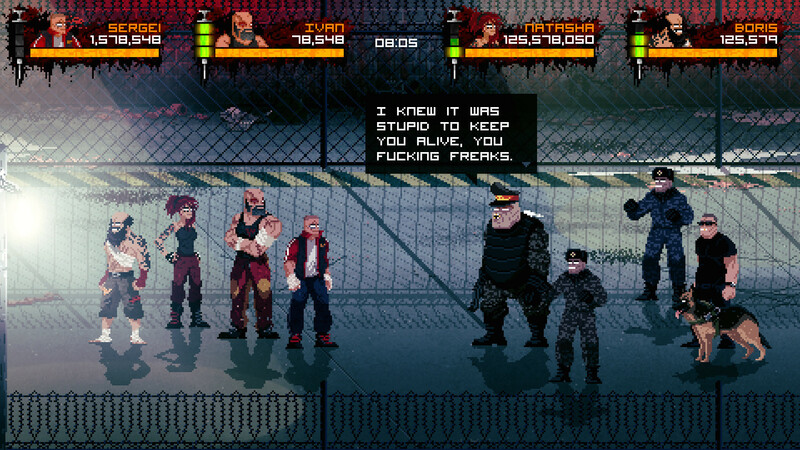 Layered on top of the standard set of attacks is Mother Russia Bleeds's Nekro syringe system, a.k.a. drugs are maybe good for you. Use Nekro to recover health, revive your co-op partners, or even go berserk. You get three injections per syringe, and to refill you have to topple an enemy and draw more from their twitching corpse. Yes, bad guys are filled with drugs. They probably dropped out of school to steal food from orphanages, too. There are about a dozen unlockable drugs in the game, each with their own affect on combat. Pick your poison at the start of the game, then let the fun begin. Page created in 0.7885 seconds.